2 Easy Ways to Change DPI of Samsung Galaxy S8 and S8plus Without Rooting. It's possible to change the DPI of your new Samsung galaxy S8 and S8+ without need to have root access. If you feel that everything you see on your screen including icons, letters and buttons is too big or small and It' very easy too. Our beloved Smartphone has a 2K display, the screen density is measure in DPI, which stands for Dots Per Inch. This gives users the ability to tweak the DPI values to whatever they want. There are two method you can use to tweaking the Samsung galaxy S8 and S8plus screen density. 1. 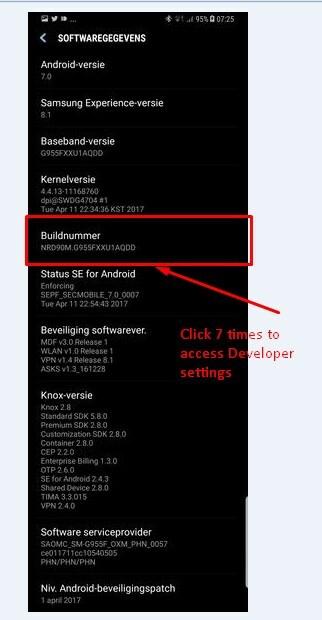 Go to About Phone > Software Info and tap the Build number 7 times to unlock the developer options menu. 2. Press the back button, you will see the Developer options menu now at the bottom of the list. 3. Scroll down until you find the Minimum width setting in the Drawing section about 3/4 of the way down. It's set to 411 DPI by default. Download Display Scaling App from Google Play Store Here . Open the App and select condensed mode. Change the DPI to the value you want. With the two method above you can easily access, the native DPI scaling menu for both the Samsung galaxy S8 and S8+ without root access. It is very fun and straight forward, without any kind of scaling issues. Phonetweakers: 2 Easy Ways to Change DPI of Samsung Galaxy S8 and S8plus Without Rooting.